The charm of this biography of a brewery soon charmed me. I started drinking Sierra Nevada’s pale ale around 2005, just after the company’s lowest point in sales since it opened in the early 80s. You could say that the brewery and I grew together. I was in my senior year at Marquette University, located in the middle of a brewer’s dystopia, Milwaukee, Wisc., when Sierra Nevada—via a convenience store called Kampus Kitchen—helped me to discover good beer. 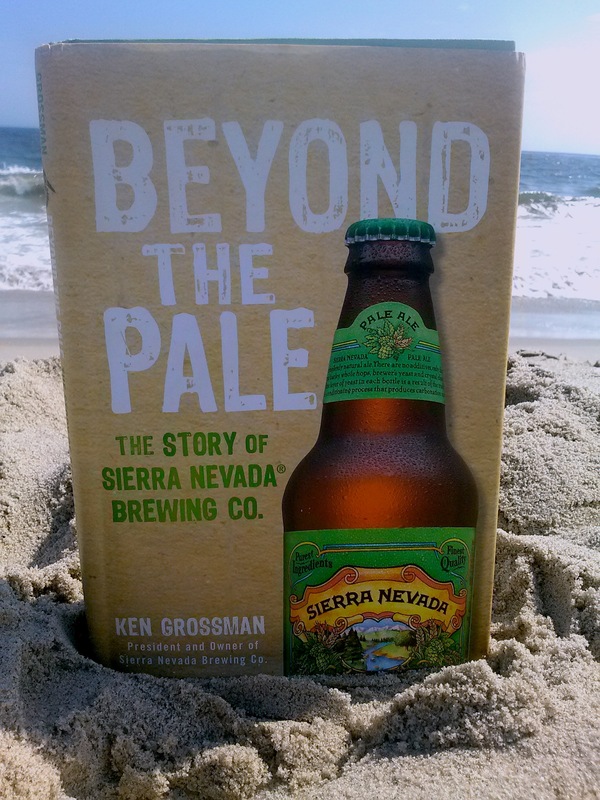 Ken Grossman, the founder of Sierra Nevada Brewing Company and the author of Beyond the Pale, started brewing in the 1970s as an accompaniment to his other hands-on passions of cycling, hiking, and all-purpose tinkering. From the start of this brewery’s biography, Grossman describes himself as being obsessed with “taking things apart and figuring out how they worked.” Once Grossman put his mind to the work of opening a brewery, the man was determined to make that venture run smoothly as well. The troubles that Grossman—and his business partner—ran into while attempting to get the first iteration of Sierra Nevada brewed, bottled, and distributed, often made me cringe in my reading. The two young founders of the brewery possessed a combination of idealism and hardheadedness in their first years in business, from shoving the brewing equipment (grain mill, mash tun, fermenter, and bottling line) into a building much too small for their operation to Grossman’s refurbishing and fabricating of equipment that would only last a short period of time before needing more repairs. Unbelievably, Grossman salvaged old dairy farm tanks for the brewery’s first fermenters and retrofit an old milk vat that he drilled (by hand) 4,000 holes in to serve as their mash tun. The work that went into getting the brewery up and running was humbling to read about—and this work continued for many years after the brewery opened. One has to wonder why Grossman felt so compelled to persist in his quest for the best possible beer. The answer to that was equal parts Grossman’s aforementioned finickiness alongside his nostalgia for an American brewing industry that was in decline at the time of Sierra Nevada’s founding. Not only was the beer market in the U.S. dominated by enormous companies like Anheuser-Busch and Miller, the beer itself was severely underwhelming to any beer lover. Grossman wrote that beer manufacturers seemed to assume that the masses of beer drinkers wanted watered-down beer and so that was what was produced. This assumption was disproven when the craft brewing revolution caught on in the late 70s: From the start of Sierra Nevada until about the time I started drinking its pale ale, Grossman described his company as struggling to make production meet the demand. So, to the beer at hand: If you are a beer drinker, it’s safe to assume you’ve tried Sierra Nevada’s pale ale. This beer, which makes up 70 percent of their sales, follows a recipe that Grossman adamantly maintains consistency on from one year to the next. The pale ale varies a great deal, however, from the hoppier, more bitter, pale ales you might sample from a different craft brewery (Founder’s dry-hopped pale ale is one example, but there are many more). I have always thought of Sierra Nevada’s beer as having a sweeter finish than most pale ales, as well as having a dark, honeylike color. The beer is exceptionally well-balanced and a great, enjoyable beer that you can drink for significantly less damage to your wallet than some other microbrews out there. Sierra Nevada and I have been growing together for almost ten years now and, while I have enjoyed countless SNBC ales alongside my friends, I think it might be time to branch out into their other brews. For instance, until I read this brew-ography, I had no idea that the company operates in North Carolina as well, and that they collaborate from time to time with other breweries, like Dogfish Head. The company also offers a rather selective Beer Camp, which trains aspiring brewers. “We all helped each other out,” Grossman said of his fellow craft brewers. While not all brewers are as interested in reaching out to the brewing community, I will confess that sentiments like Grossman’s are what have always attracted me to this activity. Beer is an extremely social beverage and perhaps the least snobbish thing one can drink. When I journey to my local homebrew store—as I plan to do this week for my first brew of the fall—I expect to be able to craft a recipe with input from the staff. At the very least, I expect to have an informative and enthusiastic conversation about this weird shared hobby. Grossman’s brew-ography, Beyond the Pale, is a hoppy validation of this belief that everyone can be a brewer.